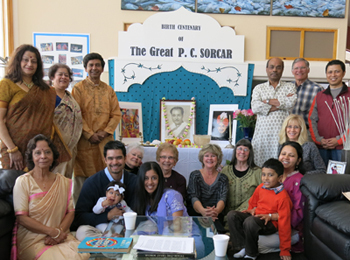 On this auspicious day of the birth centenary of the Great Sorcar, as the celebration took place in different cities in India, Manick Sorcar and his family paid a special tribute to the great man by inviting friends, family members and magic-enthusiasts in general, at their residence in Denver, Colorado. 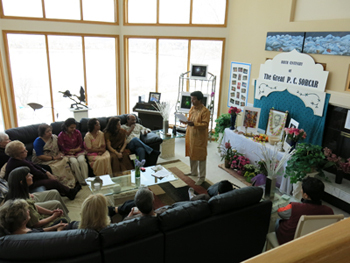 The guests started gathering around 11 am in the beautiful morning. 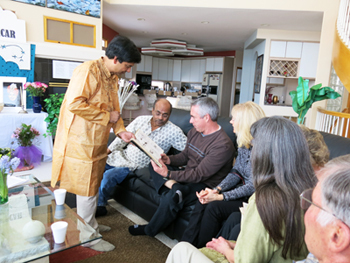 Manick and his wife Shikha read verses from the Holy Geeta, the sacred book of Hindu religion and lighted the lamp and incense. 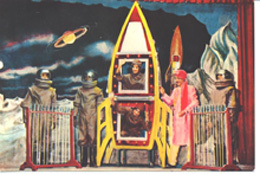 "The whole world knew him as The Great P. C. Sorcar, the legendary magician with sparkling Maharaja costume and plumed turban, " said Manick, "but in my eyes he was a totally different person. At home he always wore native Bengali clothes, a very simple and loving man - but a strict father - who always made sure we finished homework from school before we did any fun things. 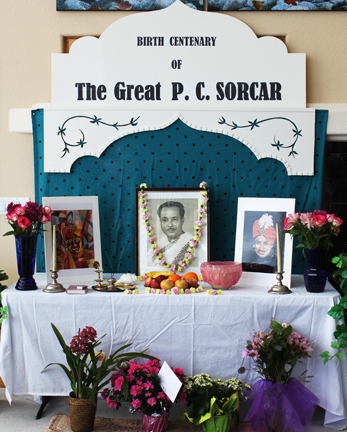 So, for today's occasion, I placed the picture of P. C. Sorcar the father in Indian clothes in the middle, surrounded by the portraits of the prince-charming Sorcar". Manick read some of the unforgettable memories from his childhood, in addition to giving a brief description of how Pratul Chandra Sorcar, a lad from Tangail, Asakpur village in East Bengal of British India step by step became P. C. Sorcar the Great. He spoke about the contrasts in his father as a magician and a father. "He stunned the world by easily bicycling in New York or Paris against busy traffic with eyes tightly blind-folded", said Manick, "but to read a newspaper at home, he asked my mother to hand him the pair of glasses". 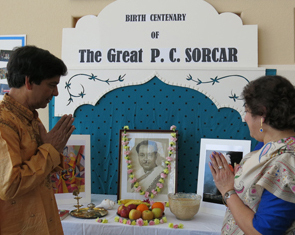 After Manick, some of the guests took turn to speak about their memories about Sorcar . (Left) Manick and Shikha light the candle and incense after reading verses from the Holy Geeta, the sacred book of Hindu religion. (Right) Manick spoke of some of the unforgettable memories with his father. 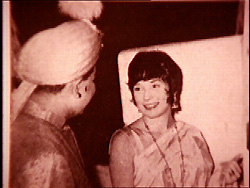 He then read a short biography of him from "The International Library of The great Sorcar", a popular web site in the internet. 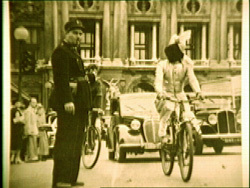 (Top left) Sorcar cycles blindfolded along place de L'opera and Champs-Elysees, Paris, July, 1950. 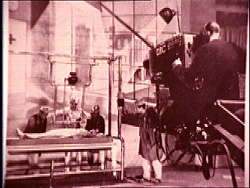 Sawing a Lady in Half with a buzz saw on BBC-TV, London, 1956. Sorcar backstage at the New Empire Theatre in Calcutta. a final respect for the day, seeking blessings. "I am immensely grateful to my father for being what I am today. 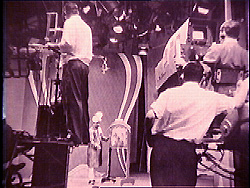 Whatever I have accomplished is because of the hands-on experience I had with art and lighting at the back stage of his magic shows, and because of his inspiration and guidance", said Manick. 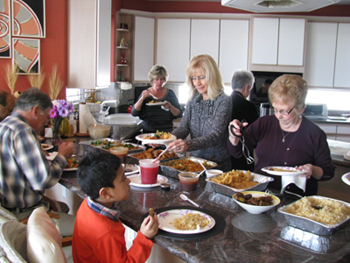 The celebration continued till the end of the day. 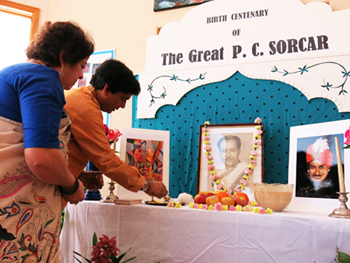 Manick and Shikha bowed down with their folded hands as they prayed for peace and sought blessings and ever-lasting love from the Great P. C. Sorcar. Note: Manick Sorcar's personal tribute - a letter to his father - was published in the newspapers in Calcutta. A scanned copy from Anandabazar Patrika of February 23, 2013 can be found here.